Andy Savage (L), Chris Conlee (R)/ Screengrab via YouTube. 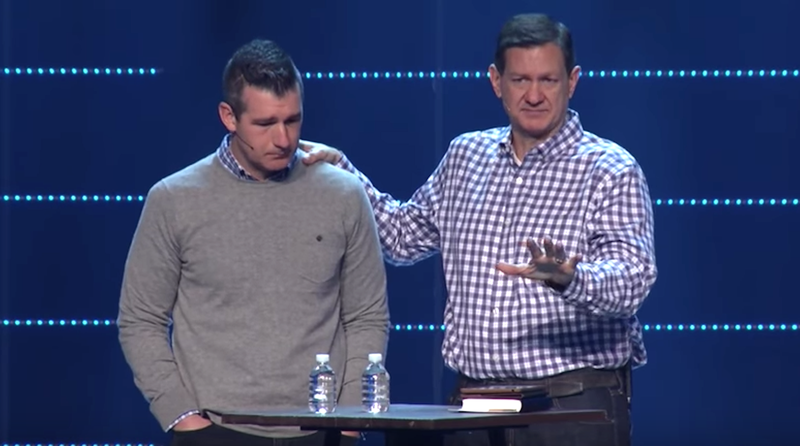 On Sunday, Highpoint Church preacher Andy Savage told the megachurch congregation that he had “sinned” 20 years ago with a woman named Jules Woodson. At the time of his alleged assault against her, Woodson was 17 years old. The congregation responded with standing applause. It was dark outside. As he was driving me towards my home, he passed the turn he should have made to go to my house. I asked him where he was going. I don’t remember his exact response, but it was something along the lines of ‘you’ll see’ or ‘it’s a surprise.’ I know for sure he did not tell me where he was taking me. I remember feeling special and excited, as in my mind, he obviously wanted to spend more time with me before taking me home. I assumed we were going to get ice cream. Just as I had finished telling my story, Larry immediately spoke up and asked me to clarify. He said something to the effect of, ‘So you’re telling me you participated?’ I remember feeling like my heart had just sunk to the floor. What was he asking? More importantly, what was he trying to imply? This wave of shame came over me, greater than I had ever felt before. Cotton wrote that she then told the church’s head pastor, Steve Bradley, who eventually spoke with Woodson’s mother, leaving her with the impression that Savage and her daughter had shared an “innocent kiss.” Savage was still allowed to go about his normal duties, including leading a workshop on the importance of abstinence. The backlash against Savage and his church’s response may end up having more consequences. His book, The Ridiculously Good Marriage, has been cancelled by the Christian publishing house which had scheduled it for a release in July. His tweets are currently on lockdown. Maybe next Sunday, less people will be applauding him.